NASA engineers are once again scrambling to find a way torestore the International Space Station's ailing cooling system back to fullstrength after weekend spacewalk repair efforts were stalled. Leaking ammonia coolant and a stuck hose forced Americanastronauts Douglas Wheelock and Tracy Caldwell Dyson to cut short theirattempts to replace a faulty cooling system pump during a Saturdayspacewalk. The astronauts plan to stage another spacewalk totackle the problem on Wednesday, and then ? if all goes well ? finally replacethe pump during an extra spacewalk on Sunday. 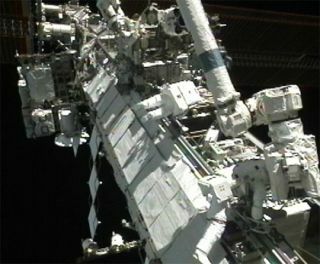 "We are pressing ahead with the second spacewalk onWednesday," NASA spokesperson Rob Navias told SPACE.com. Wheelock and Caldwell Dyson spent more than eight hoursworking outside the space station Saturday to try to disconnect the oven-sizedammonia pump from its mooring on the space station's right side. But one offour liquid ammonia hoses initially refused to budge, and then began leakingammonia once Wheelock freed it by hammering on a connector with a tool. The faulty pump is in one of two cooling loops servingthe space station's U.S. segment. A second loop is working fine, missionmanagers have said. The space station's Russian segment also has its ownindependent cooling system, they added. NASA engineers and mission managers spent all of lastweek planning Saturday's attempted spacewalk repair. The job was already socomplicated that two spacewalks would be necessary, station managers said at thetime. Now, a thirdrepair spacewalk will be required before Wheelock andCaldwell Dyson can completely replace the pump with a spare one and restore thespace station's ammonia cooling system. On Wednesday, the astronauts will have to disconnect twoadditional ammonia plumbing hoses elsewhere on the space station in order tostaunch the leak that occurred when Wheelock initially tried to remove thefaulty pump, Navias said. Once that work is complete, the spacewalkers will vent any remaining ammonia from the final ammonia hose, then disconnect it along with five support cables and bolts in order to remove the pump. Each pumpweighs 780 pounds (353 kg) and is 5 1/2 feet long (1.6 meters) by 4 feet wide(1.2 meters). They are about 3 feet (almost 1 meter) tall. The disabled pump will be stored on the station'srailcar-like Mobile Transporter system, Navias said. "That's probably as far as we're going to get onWednesday and that then would set us up for a Sunday spacewalk," Naviassaid. It would be on Sunday that, if all goes according toplan, Wheelock and Caldwell Dyson would be able to retrieve the spare ammoniapump and install it, Navias added. The $100 billion International Space Station is currentlyhome to six people. Three are American astronauts with NASA and the rest arecosmonauts with Russia's Federal Space Agency. Construction on the space station began in 1998 and isslated to be completed next year.